If you watched the Great British Bake Off for Sports Relief you will have seen one of the technical challenges was for all the contestants to make Mary Berry’s Banana and Chocolate Loaf cake. Surprisingly, for such a simple cake, it was one of the most disastrous challenges I think I’ve ever seen! However, I was inspired to give it a go, convinced that I could make a better job of it – and I did! 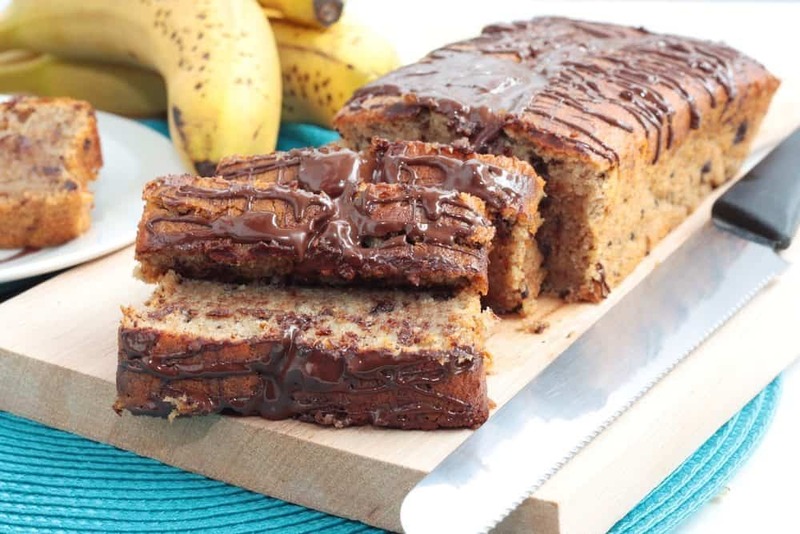 I always seem to have overripe bananas in the fruit bowl, so any recipe that uses up squishy bananas is going to be a hit with me – and this one was truly delicious. This may be because I melted a Lindt Teddy Bear to drizzle over the top but I’m sure any sort of chocolate would be equally yummy! Preheat the oven 160C/325F/Gas 3. Grease and line a 450g/1lb loaf tin with non-stick baking parchment. Use a fork to mash the peeled banana in a mixing bowl. Add the remaining cake ingredients (except the chocolate chips) and beat with an electric hand whisk until combined and smooth. Stir in the chocolate chips and spoon the mixture into the prepared loaf tin. Level the top. For the decoration, break the chocolate into small pieces and add to a heatproof bowl. Melt the chocolate in the bowl over a pan of simmering water (ensuring that the bowl does not touch the water). Stir regularly, until almost completely melted, then remove from the heat. The heat of the bowl will melt any remaining lumps. Spoon the melted chocolate into a piping bag and pipe zig-zags across the top of the loaf. Set aside for the chocolate to set. Slice and serve. As with all our cake recipes, if you do decide to give it a try, we’d love it if you came back and left a comment as to how you got on. Happy baking! I agree, a banana loaf can easily go wrong – but if done right, there’s (almost) nothing better. The choc chips make a nice addition. This is another easy recipe if you have any leftover bananas. I have made this twice and both times the chocolate sank. Any advice? My daughter loves banana cupcakes and been asking me to bake for the last weeks. AND I also just bought this loaf pan, what do I do now.. Googled and I came across your blog with banana choc chips loaf….I doubled the recipe. 15 mins to prepare and 55mins in the oven…the result: beautiful,puffed up glossy loaf and yes, not too sweet. Thanks for the recipe.